A few years ago my wife got the bug to keep chickens and last year she got busy researching coops, urban chicken keeping, etc. We live in the suburbs but we are permitted to keep a small flock. After clearing it with our neighbors and writing a letter to our HOA stating our intentions my wife got the green light. 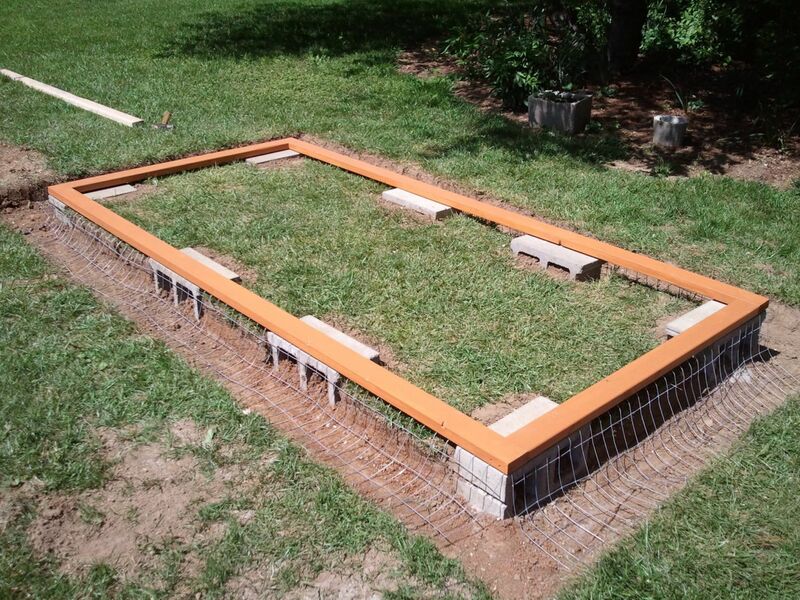 This spring we broke ground on our coop and we finally finished the build this past weekend. 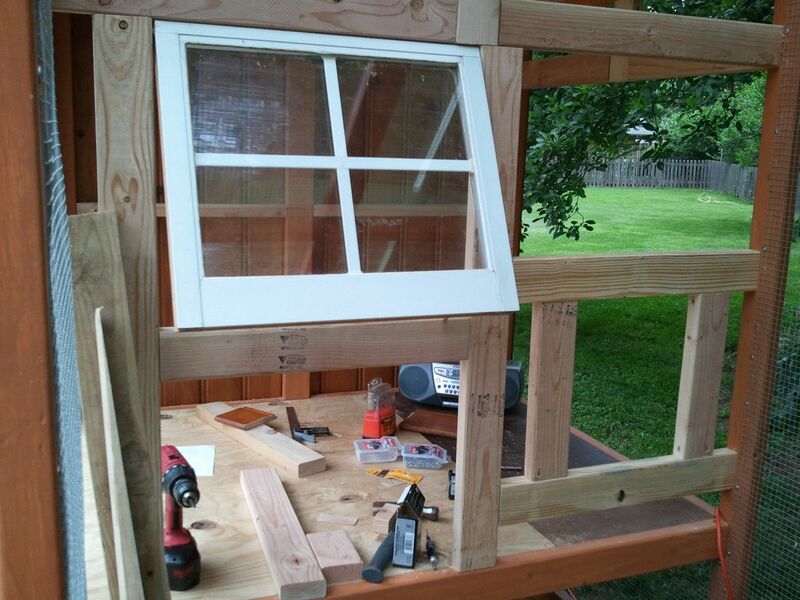 Since we relied on the experience and especially pictures from other folks I thought I'd share the steps of our build. It's a blend of a few existing coop plans we found online and in books as well as modifications and original ideas we came up with. We used Feather Factory and Florida Coop as our inspiration and stepped off from there. This was the most useful book we consulted. The coop is situated at the back of our garden. 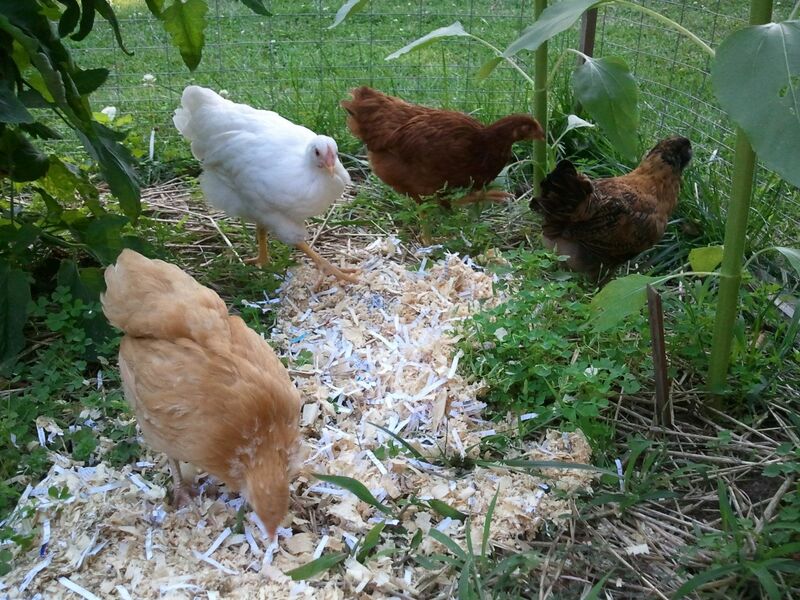 We plan to compost the chicken droppings and use it to fertilize the garden. Also, we can let the hens out of the run into the garden for "supervised visits". We've already had to shoo them out of the strawberries a few times. 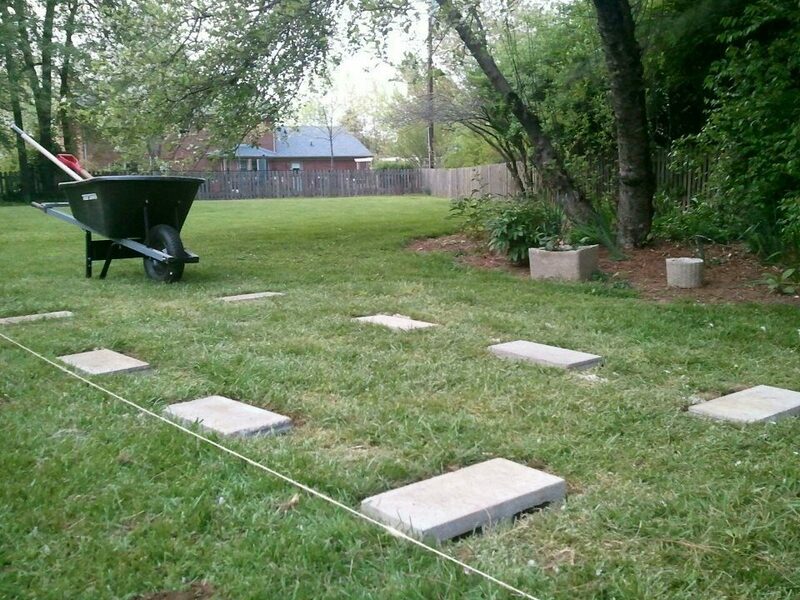 First off, my wife dug out then placed & leveled our concrete block foundation. On to the base. It's 5' X 10'. I attached welded wire to the base, flipped it, bent it to fit the trench I dug around the block and back filled with sod. The idea here is a predator trying to tunnel under the coop will run into welded wire instead of breaking through. I wasn't happy with the staples I used to hold the wire to the base so I fell back on my safety wiring experience from the Navy to make sure critters couldn't get in through the bottom. 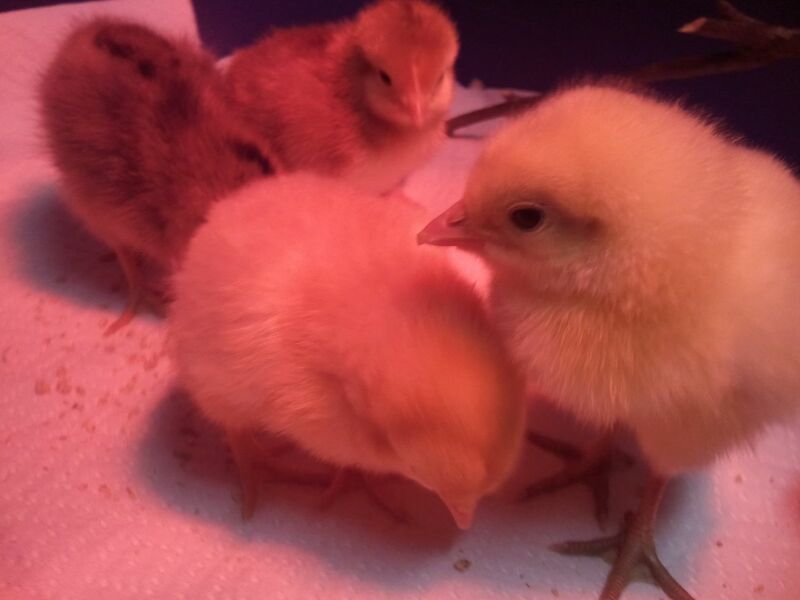 Chicks are here! Time to get crackin'! Next up, the frame. I rough cut all the pieces and my wife sanded/stained them before assembly. 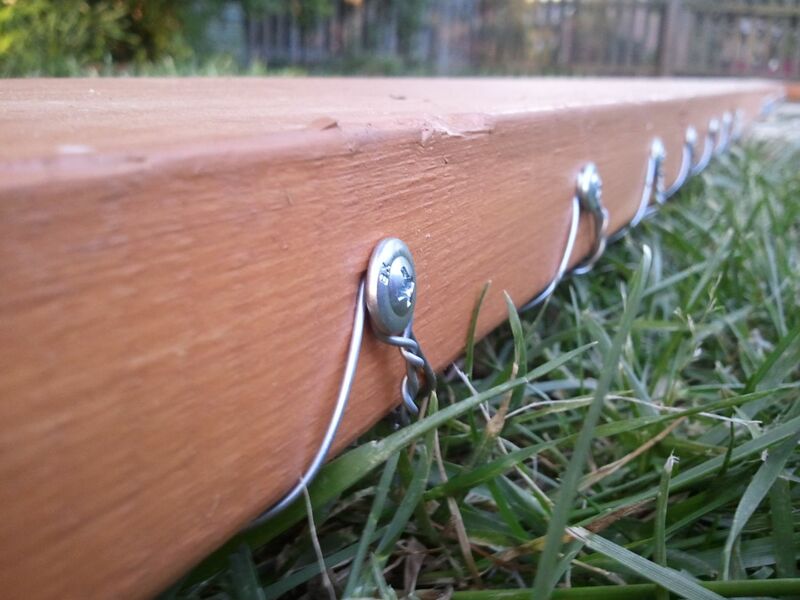 I also attached most of the hardware cloth while I had individual pieces of the frame on the ground. The chicks visit their run for the first time! My FIL supplied windows and old knotty pine paneling that had been sitting in his shed for the last 25 years and was originally on my wife's cousin's family room walls in the 70s/80s. Here's the pop door in action. I rigged it to an overhead pulley and ran the line through a hole drilled in the front of the coop and out through another pulley on the outside. 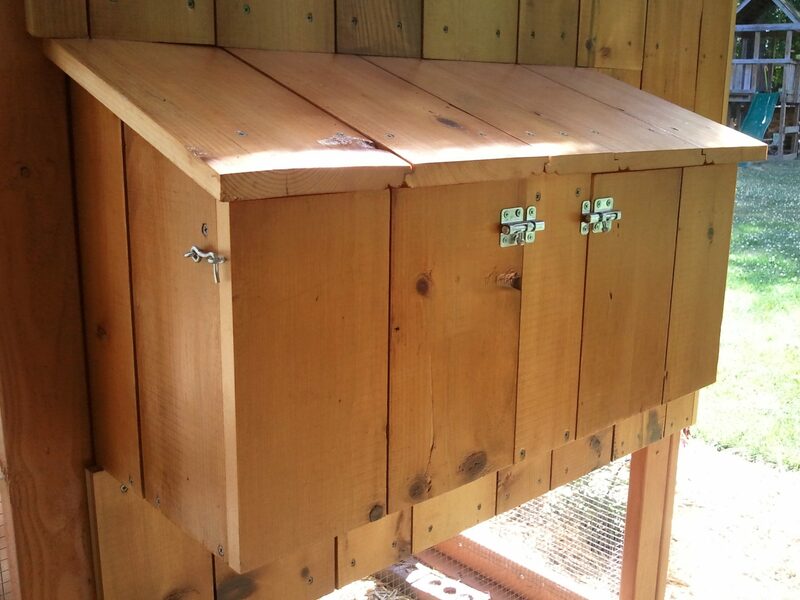 The nest box. We decided on a double nest box. I used the paneling to build it and since it's lapped the doors fit together seamlessly. I used a piece of MDF (I'd run out of wood) and routed out two circular holes in the front of the box. Here's a shot looking through the front door to the nest box in the back. Also the pop door and the roost. We have vents running at the top above the nest box and pop door as well as two windows that prop open for additional ventilation. 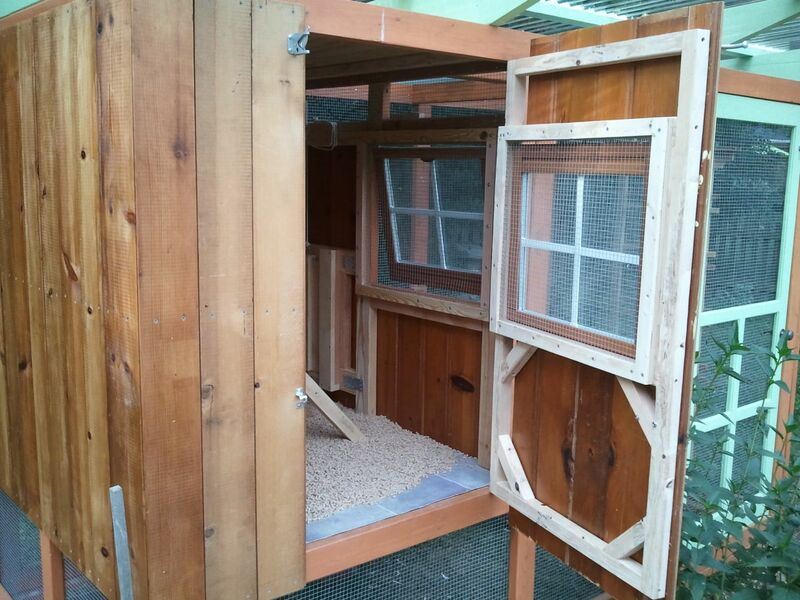 The finished coop with shots from a number of different angles. I sanded and sealed the paneling with marine spar varnish. 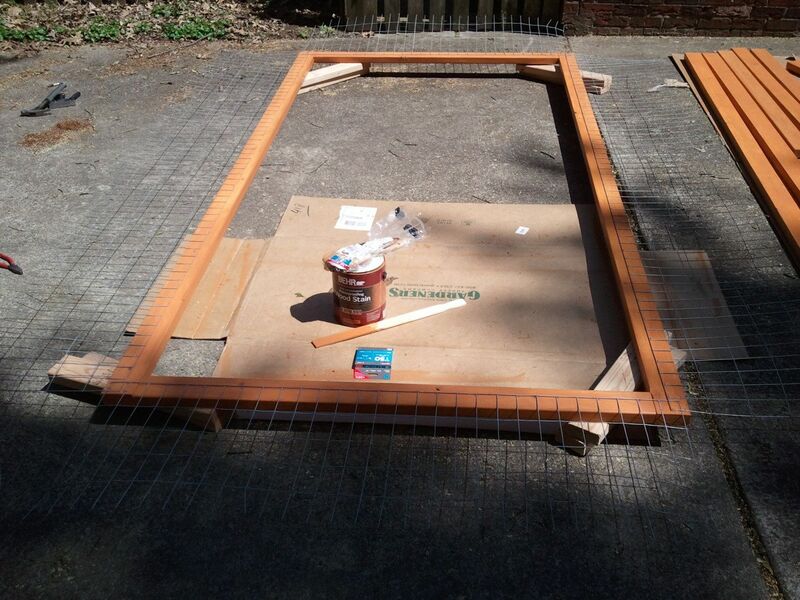 The screen door came from our local Habitat for Humanity ReStore. The roof is clear polycarb panels from Lowes. 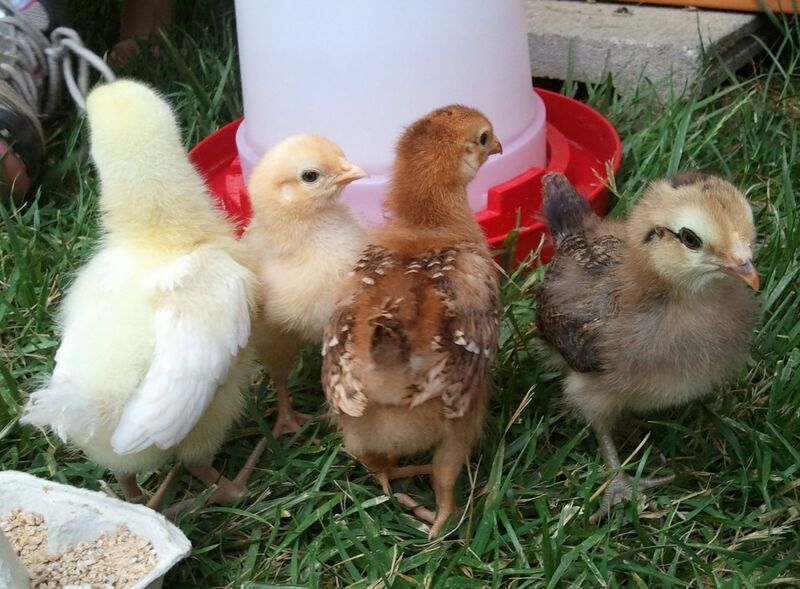 Here's a close up of each hen. My wife named them after the state flower of states we've lived in. 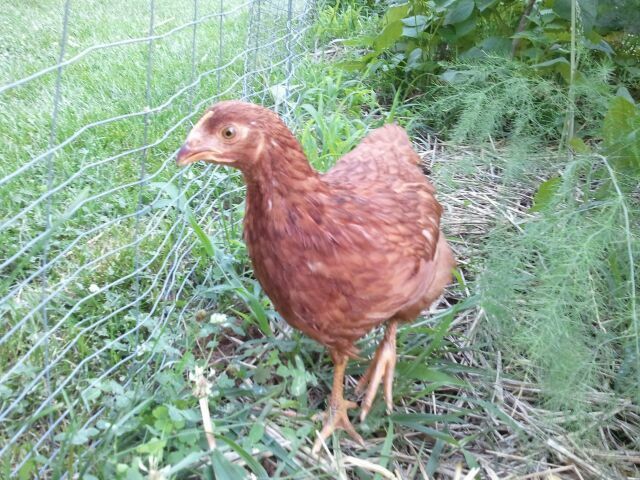 "Freebie" is named after the free chick we got from Meyer Hatchery in Ohio. Under their "Meyer Meal Maker" plan you can get a free chick if you promise to give the eggs the hen produces to a local charity/food bank, etc. 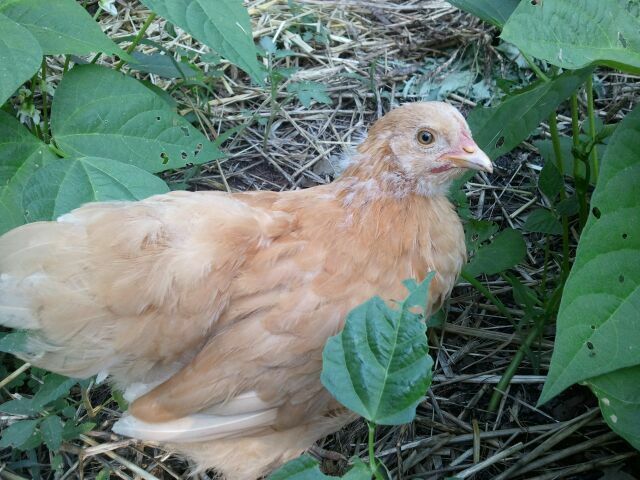 Goldie, our Buff Orpington. She's a total sweetheart and thinks she's a parrot. As soon as you approach her she hops on your shoulder. Scarlett, our White Rock & the flock leader. Violet, our Easter Egger. We're hoping green legs = green eggs! 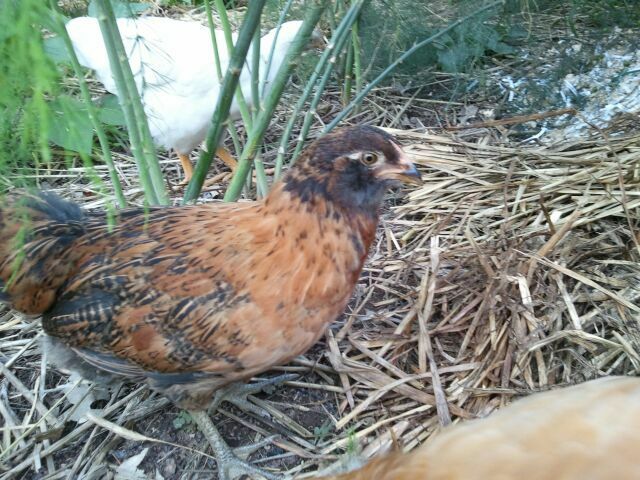 And finally Freebie, our Rhode Island Red. She's a little cautious and likes to challenge Scarlett. Looking back on the build I would do a few things differently. The first is simple carpentry. I'm not new to building but slowing down and thinking about each cut helps minimize waste. I had a limited supply of paneling and I burned through a few too many pieces making fast cuts. If you're planning on using roof rafters like I did make sure you have a hefty saw and an outfeed table. I struggled with my table and circular saw to get consistent cuts rafter to rafter due to their size and weight. Also, I think I'd change the stain color. We stained the 2X4s with a cedar stain that ended up looking very orange after the second coat. Lastly, more time. We broke ground in early April and wrapped up in mid June. 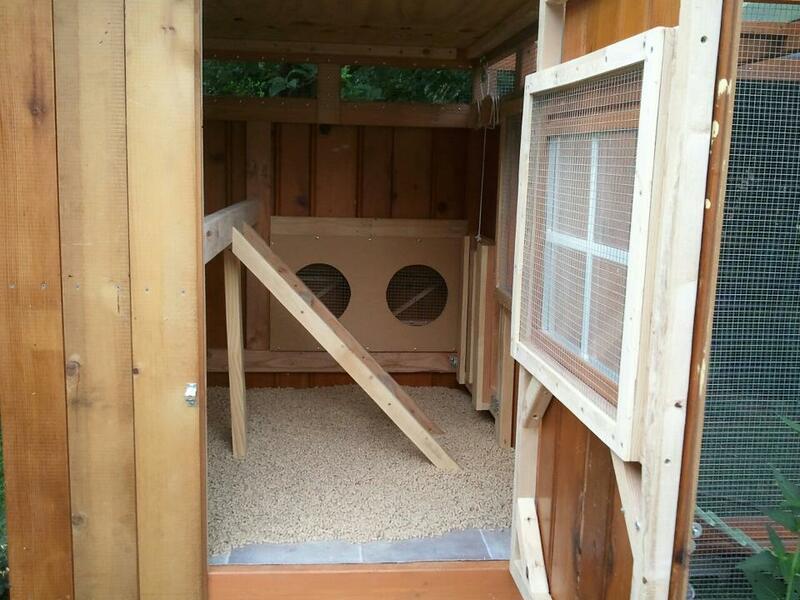 We spent 2-3 solid weekends busting our tails trying to get this done before the chicks outgrew their brooder. Overall... a wonderful experience, especially for our children. dreamerhps, Rhella, MissPoulette and 7 others like this. Great job guys ! Very functional and beautiful! Great article. 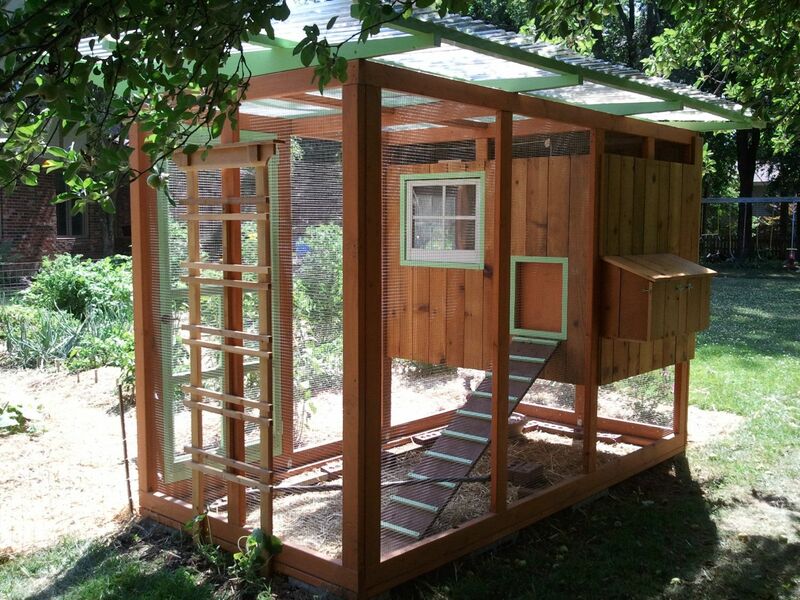 That is a super cute coop & I love the step, by step pictures. I also had no idea Meyer had a food bank program for eggs, so thanks for adding that bit of info. Not to get too off topic, but where & how often do you donate the eggs? Your coop is amazing, MisterChicken! 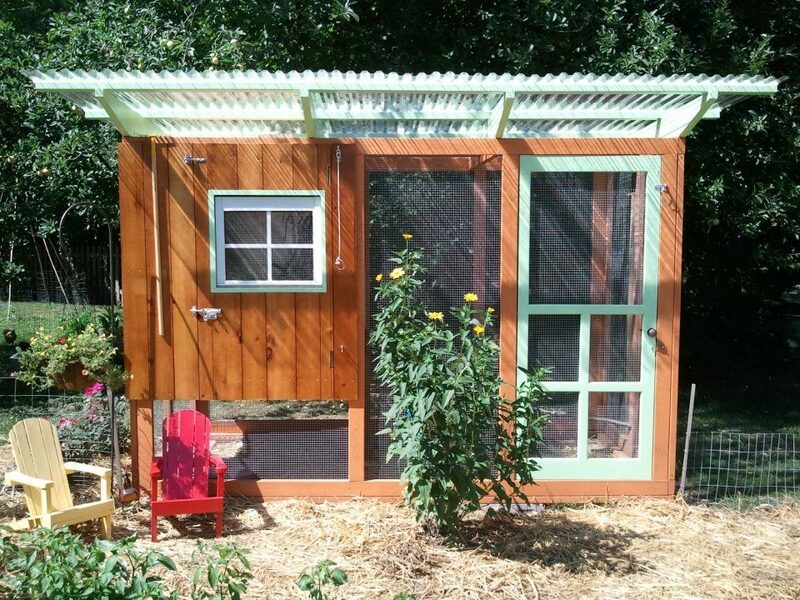 I've been researching coops for a couple of years -- meticulously planning our hens' dream home -- and I keep coming back to your coop as my primary inspiration. Thank you so much for sharing the details of your design and approach. One question, is the coop bolted to the foundation? love the color of this coop! Very pretty. Love the color. 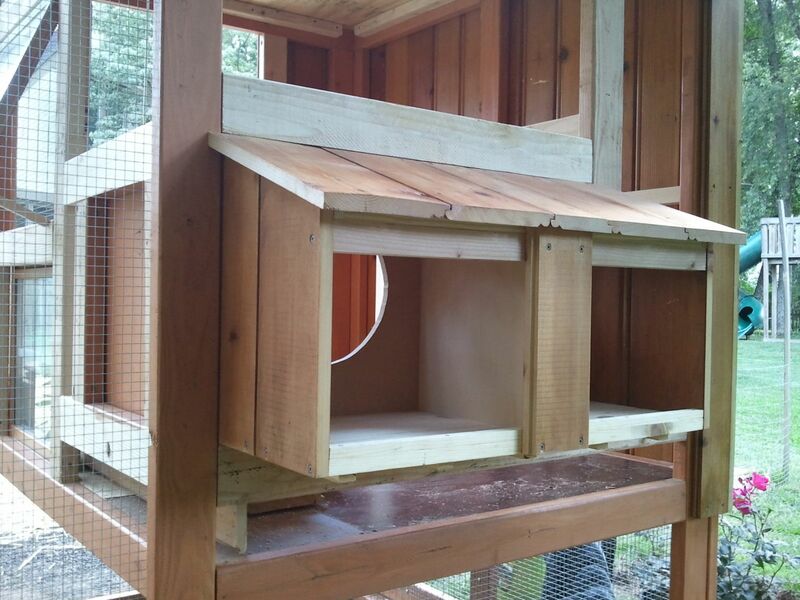 Really love the round openings on the nesting boxes. And, the girls are sweet! Congrats! Very nice coop, thanks for sharing. Cute chicks. 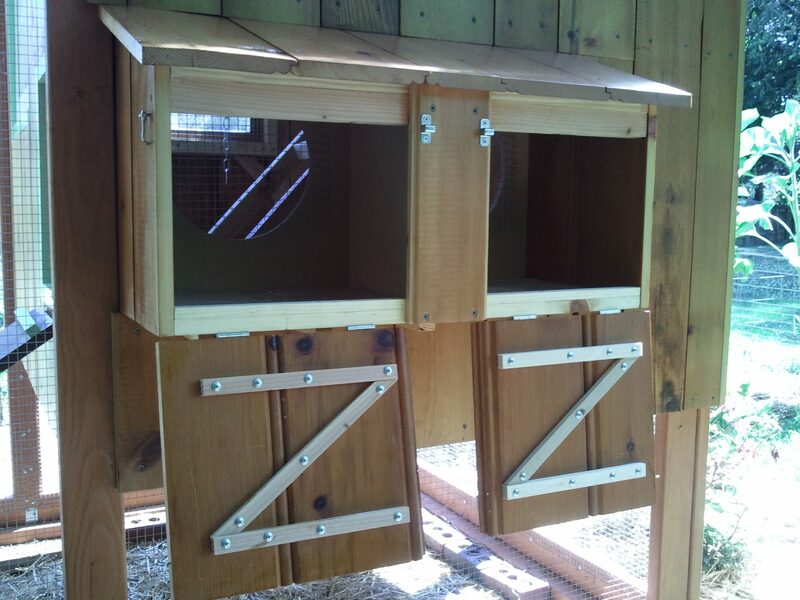 Very nice coop and flock! 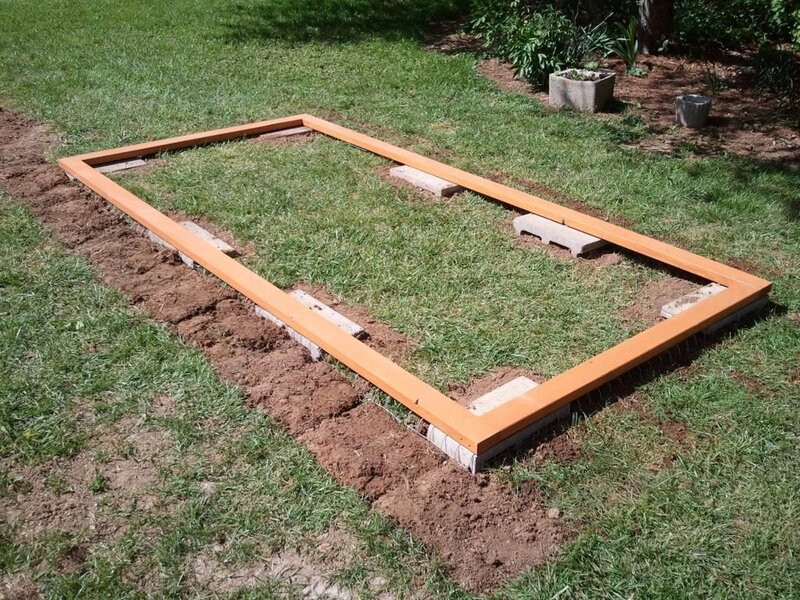 You did a great job on your coop and it looks great. Lovely hens and I love their names. The only thing I'd change would be to make it bigger. I don't live in the suburbs. I live in Texas. Everything is big in Texas. 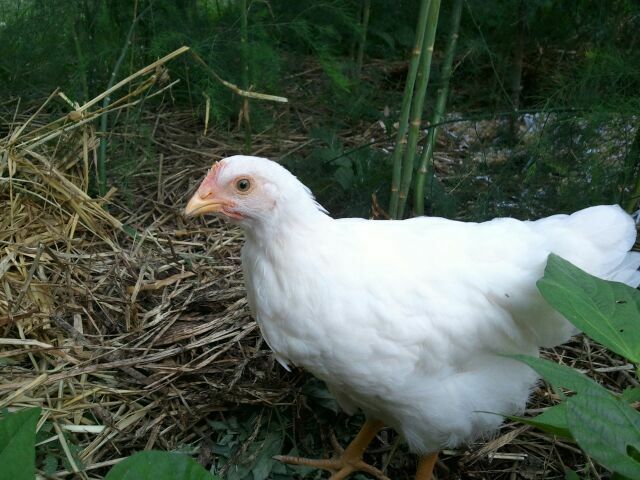 Plus, I can, and do, have a cockerel and he and one of my hens are Large Fowl Langshans and they're pretty big birds. 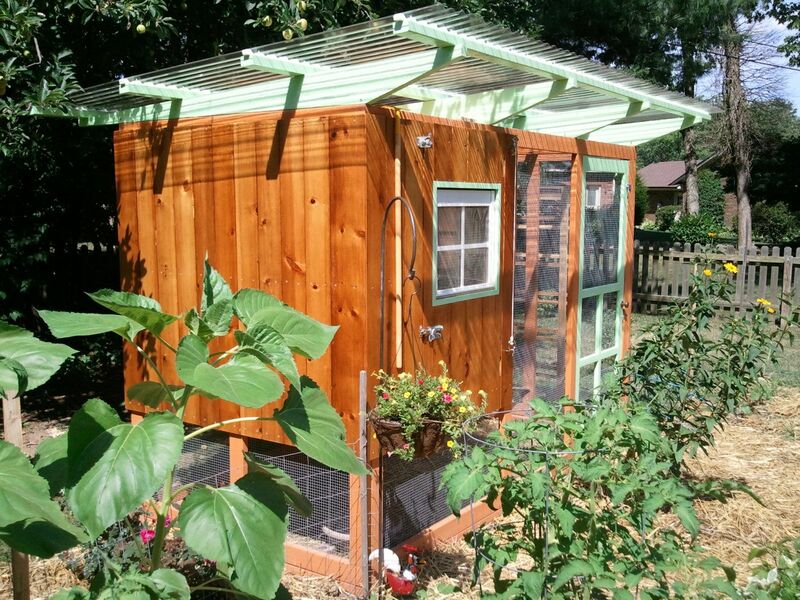 I'll be building a ****** coop soon, I hope, since I'm loving having chickens and there are several breeds I'd like to try that I don't have right now. Chicken math! 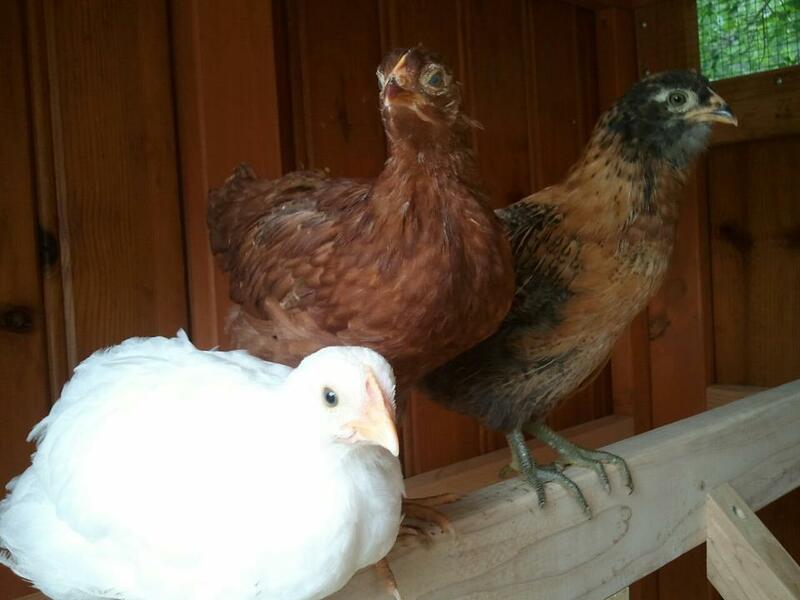 Thanks for sharing your lovely coop! Oh, and I love the trellis on the end and the little chairs are adorable! This coop is Awesome ! Wow, love your coop! Cudos to you and your wife on building a beautiful and secure home for your girls. And what a nice mix of birds you have. Won't be long and you'll have plenty of eggs for yourself and your accommodating neighbors. Thank you for sharing your build! I painted before- laid them all out on saw horses! 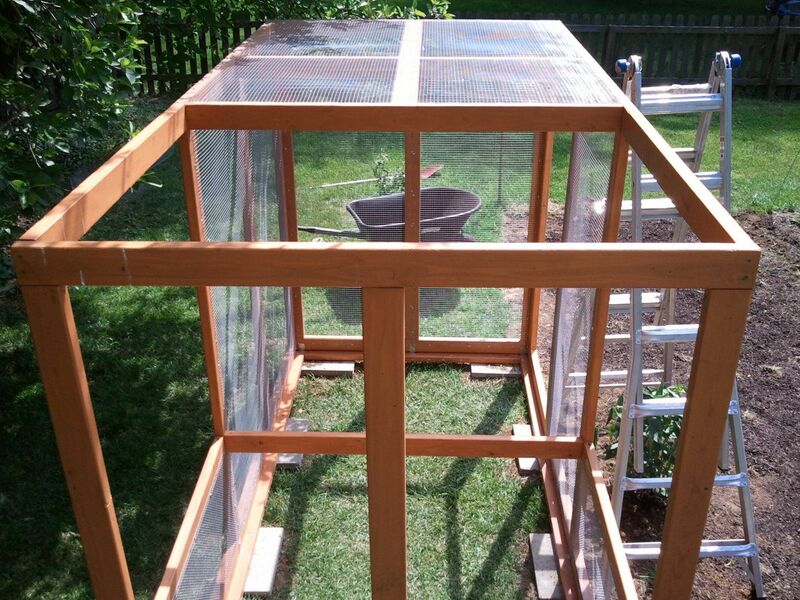 I love this coop and am constructing one just like it--thank you for the inspiration. I do have a very specific question. Did you paint the roof beams BEFORE installing or after? I just want to know what the easiest thing would be. How much does the roof overhang the structure? What did you put on the roof of the coop to protect it from the rain and snow? Or do the polycarb panels protect it enough? We've had a couple summer storms producing wind gusts probably 50-60 mph. Enough to knock my tomatoes, okra & sunflowers down but no issues with the roof panels so far. Do you have any problems with the wind getting up under the roof panels? I like tw roof idea but was worried about wind getting under it and possibly ripping it off. If I remember correctly the coop is about 5' by 10'. I'll have to go out and count the panels. also- what are the dimensions on the roof rafters? That's a great design for the roof, extra hardware cloth, but it has a great look to it. Thanks again. love it! what is the foot print of the whole thing- and what are the dimensions for the roof? I was wanting to do the same kind of roof, and I'm wondering how many panels you had to use/buy. Thanks! Can I ask how you installed the windows? Are they on dowel pegs of some kind so the swing? I don't see hinges for them. I'd share them if I had them! I built it on the fly, just kind of improvised as I went. Would you be willing to share your build plans? I really don't think I'd change much... maybe make the run a bit bigger so the hens have more room to scratch. The cost- I honestly don't know. Lumber, stain, hardware, etc. didn't really keep track. We used recycled & reclaimed materials as much as possible. Now that you have had this (very nice looking!) coop for a bit, is there anything you would change? Do you remember what it cost to build it? That is just lovely. Really and truly. Squeaky, that's spectacular! Nice, big run with plenty of room to scratch too! https://dl.dropbox.com/u/15272527/coop_.jpg Thank you for the inspiration,! It is almost done! Beautiful! The proportions are very pleasing and JMHO but I think the stain color looks great! I believe the roof beams were 8 or 10 foot 2X8s that I cut down. This was one of the most difficult parts of the build. Ideally you'd want a cabinet saw with a substantial outfeed table to get consistent cuts rafter to rafter. I had to settle for a clamped straight edge and my circular saw. 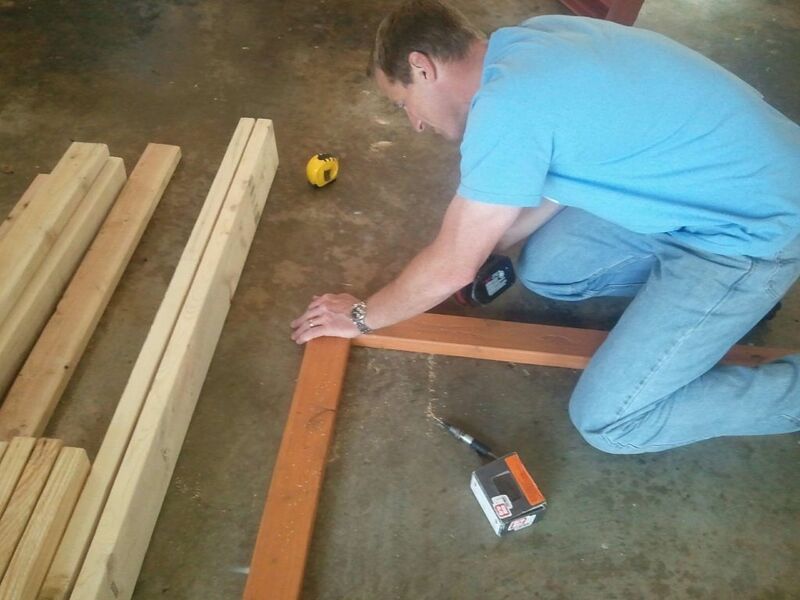 The main construction of the coop box and run is 2X4s. Please post pics... I'd love to see your version! I hope you don't mind, but I'm trying to copy your coop. I'm very jealous of your amazing wood paneling for the siding, I wish I could find some! Are the roof beams 2x6s or 2x8s? Are the tiny beams 2x4s? That's a door we picked up at our local Habitat for Humanity Restore. I had to cut it down a few inches to get it to fit. The coop is around 9 feet at it's highest. I love this coop. Did you use a real door, or did you build the door? How tall is the coop? Yeah, we don't have a snow load problem here... I can see how that would be a concern. Glad you found a solution that works! We ended up changing our minds and went with a shingled roof. After buying the grey polycarb panels, we started worrying about snow load (we have a big run) and as the expense was pretty much the same for either option, we went with the old stand by (which is what we had done the coop with.) Thank you for your answers early when we were in the process of deciding. Wow! Great job!! It blends perfectly in with your yard too. The hardest part with the rafters was cutting them! Installing them was fairly easy... I countersunk 4" coated deck screws at an angle through the base of the rafters and into the roof of the coop then filled with caulk. love it! I think I may have to steal your roof idea. Was that hard to install or do you just screw it in? You guys did a lovely job on your coop! 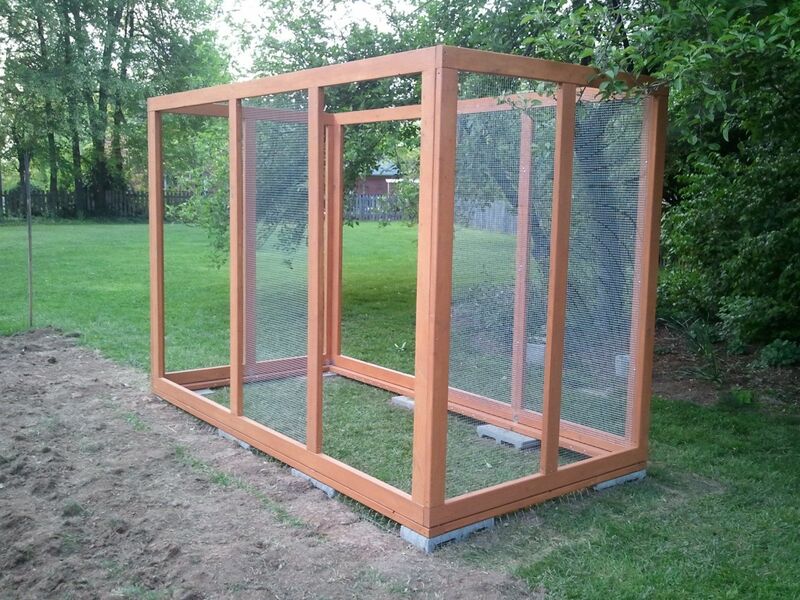 Well-built, secure, and looks nice too - can't give a higher compliment than that... And I'll bet those pretty girls are some spoiled chickens too...lol! Nice clean looking job, well done. 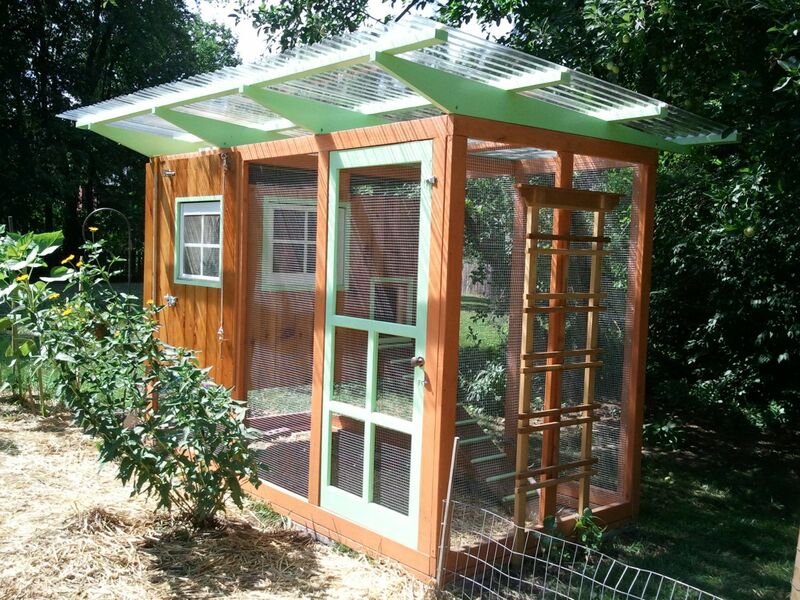 The only issue with the clear panels is there's no shade in the run @ certain times during the day but they can get in the shade under the "coop". We debated over the clear vs. tinted panels for a few weeks. They're very easy to work with and it does beat heaving shingles.